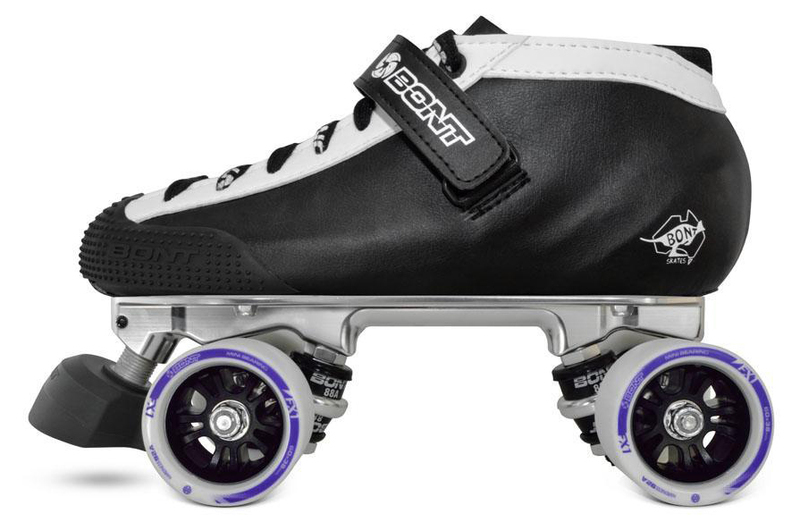 Get ready to out skate the competition with the Bont Hybrid package. Most entry level packages are made with old construction techniques using cardboard and wood. The Hybrid has a fully hand made fiberglass base and it is heat moldable to your feet! The fiberglass in the boot is made hard by the use of a thermosetting epoxy resin. Resin development is something that we have been doing since 1975. Formulating a resin that is super stiff, yet becomes moldable at low temperatures and has a fast cure time is critical for our unique requirement which is why we are the only skate manufacturer who develops our own resins in-house. The Hybrid is made with high density closed cell memory foam. This padding will not deform over time or retain water from sweat or wet surfaces. The Hybrid boot is only available in black with white trim. Conventional quad skates offer a “dress shoe” type shaping. Although highly aesthetic this will cause the toes along with the metatarsals to be overly constricted, compressing the nerves between the metatarsals which often results in the common "hot foot" sensation. Bont skates anatomical shaping allows the foot to function in its most efficient and anatomically correct position. The anatomical heel cup shaping of Bont quad skates provides increased stability and more power through your push. 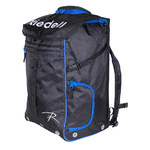 This stabilization is achieved without any mechanical operation or over tightening of straps/laces allowing for increased comfort and blood circulation. The heel cup is fully heat moldable in the oven. The chassis is made of extruded 6061 aircraft aluminum. The cushions are made in the USA from premium ultra high rebounding urethane. The plate is made to extremely tight tolerances. The plate has a low profile which means that the wheels are closer to the boot than most plates. This lowers your center of gravity and improves edging. Our Athena plate has proven itself on the toughest skaters in the world: the Bont Quadstar derby team. The 20-degree kingpin angle is great for making tight turns as well as top end speed. A variable adjustment nut and grub screw allow you to skate your plate tight or loose to suit your style. The plate features delrin pivot cups. The plate is triple polished with a final brilliant shine polish. For beginners of our sport it's not quite easy to decide which size will fit for your feet. Here we will show how to choose the correct size based on your real foot length. Therefore put on some socks you would also wear while skating. Then press your heel against the a wall (as shown on the picure below) and take the length to your longest toe. Note the length in millimeter. When you have chosen a roller skate and opened the product page you'll find a sizing chart on the right hand side and below the product picture under "availability/prices". There you can see the "length" in millimeter. This length refers to your measured foot length. Please don't pay attention on the EU, US or UK sizes. Due to different fits of shoes and roller skates it's quite difficult to choose the correct size with these information. IMPORTANT: The exact fit of the roller skates also depends on your individual foot structure. So if you have a normal foot structure, neither very narrow nor very wide, you can go for the exact measured foot length. But if you have a very wide foot structure you should take one size bigger. Example: Your measured foot length is exactly 251mm and your foot structure is normal, you should go for S 7.0 on the sizing chart shown above. Because if you are between two sizes you should go for the next bigger size. With very wide wide feet we recommend taking the next size what would be S 7.5 in this case. These recommendations are made to find the tight but comfortable fit for your roller skates. Since roller skates are sport equipment the correct fit is very important. Please note that due to the huge amount of different foot structures and skate types there will be no guarantee for the perfect fit. But our recommendations refer to our experiences and the experiences of our customers.